DJ Julia Daye for an evening of dance. 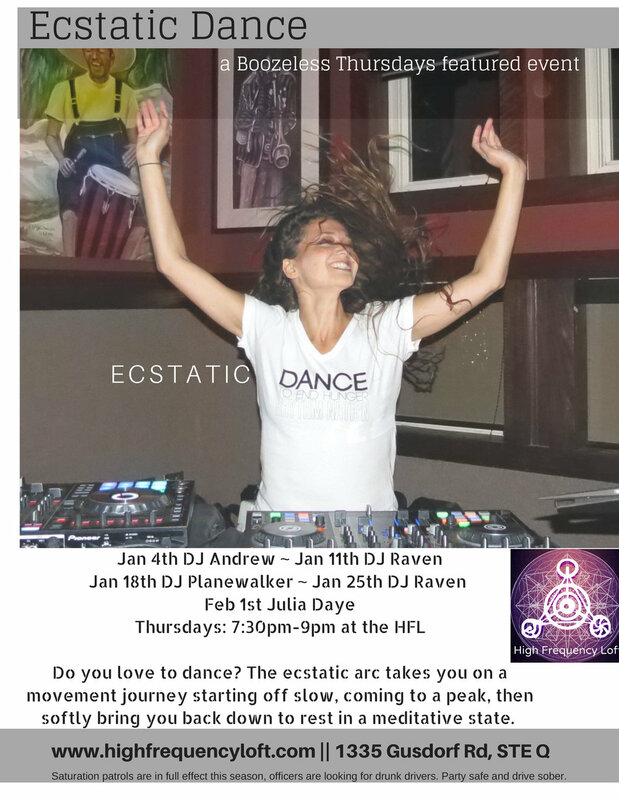 The ecstatic arc takes you on a movement journey starting off slow, coming to a peak, then softly bring you back down to rest in a meditative state. No structure, no judgements just move your body any way that you'd like. Find peace, freedom, joy & bliss through the music & the dance that emerges from within. This will be a Boozeless Thursday featured event. Brief Description: Join the Taos Land Trust and Groundwork Studio for an important community vision session and conversation about the future agricultural and ecological park. Light food and refreshments, paper sculptures, and more. Howl is a journal of the arts. Howl represents the powerful voices of Taos and its diverse Northern New Mexico culture. UNM-Taos students produce Howl to showcase a selection of written and visual arts. If you have an original art piece or an original writing, then SUBMIT to UNM Taos' HOWL! There you will find a submission form and all the information you need. If you have any further questions feel free to contact us via email at unmtaoshowl@gmail.com. Join various DJ for an evening of dance. The ecstatic arc takes you on a movement journey starting off slow, coming to a peak, then softly bring you back down to rest in a meditative state. No structure, no judgements just move your body any way that you'd like. Find peace, freedom, joy & bliss through the music & the dance that emerges from within. This will be a Boozeless Thursday featured event. We would like to invite you and your family to join us for an exciting and educational Community Science event. It’s a mini-Explora to be held at the Taos Youth & Family on Friday, January 19, 2018 from 1:00 PM – 3:00 PM. 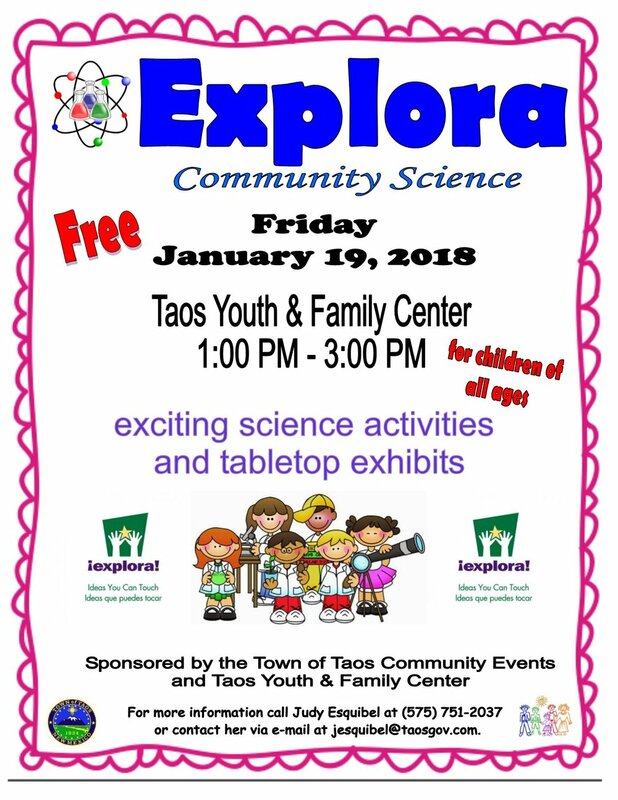 This fun outreach program from Explora, the Science Center and Children’s Museum of Albuquerque, is offered FREE of charge and is for audiences of all ages. The event will provide science activities and tabletop exhibits set up for a self-guided, hands on exploration. Come to Explora and get a chance to do some awesome experiments with your family and friends! Learn together and have some fun at the same time! 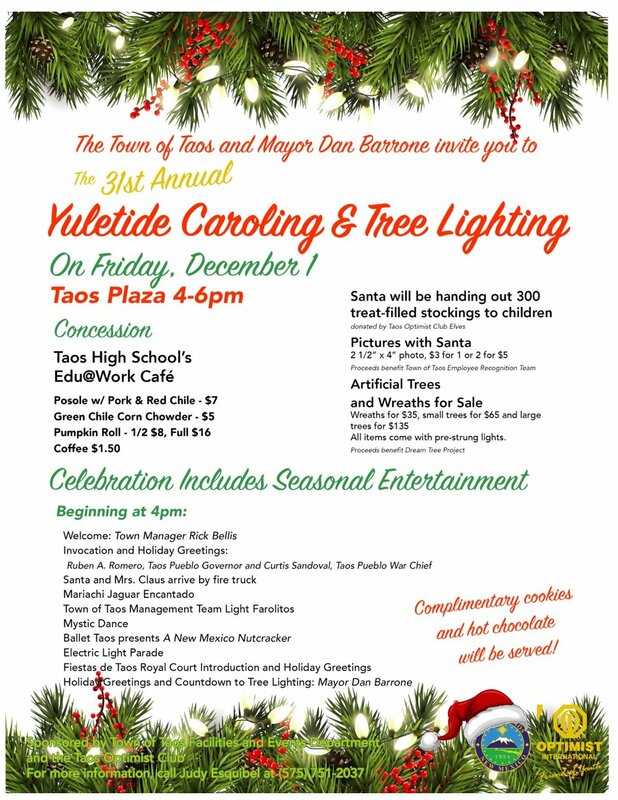 This event is sponsored by the Town of Taos Community Events and Taos Youth & Family Center. Contact: Judy Esquibel at (575) 751-2037 or contact her via e-mail at jesquibel@taosgov.com. DECRIPTION: On January 16th join TEN for our first 2018 TEN Event. Key note speaker Marko Schmitt will be presenting "Life"s a Pitch." 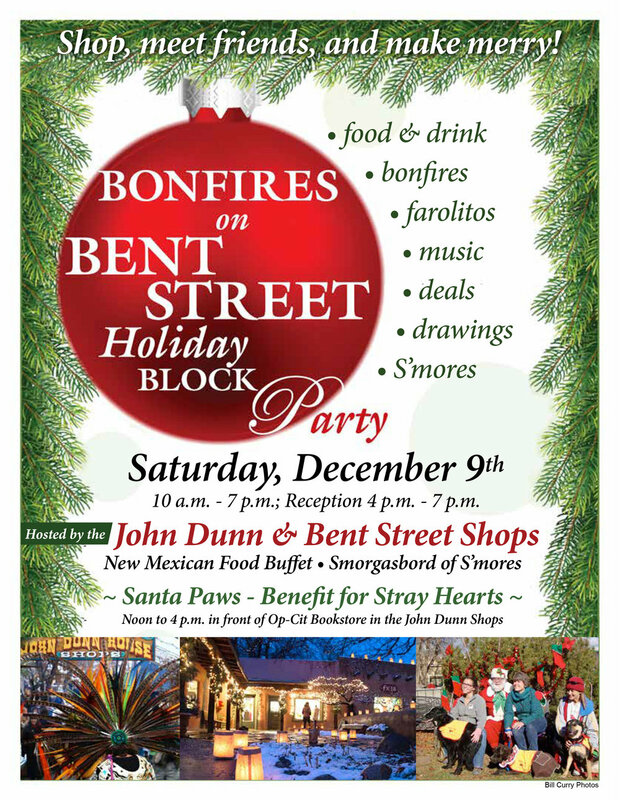 LOCATION: UNM Bataan Hall- 5:30 p.m to 7:30 p.m.
DECRIPTION: John Dunn Shop and Bent Street Merchants host the 29th annual Bonfires on Bent Street. Farolitos and luminarias will light the way as you stroll with family and friends and enjoy entertainment, food and drink, shopping, bonfires, and much more. WHEN: Dec. 9 Reception from 4 p.m. - 7 p.m. Be sure to make time for Santa Paws, to benefit Stray Hearts Animal Shelter, from 12p.m. to 4 p.m. LOCATION: in front of Op-Cit Bookstore in John Dunn Shops. Saturday, December 9th, open till 8pm and 10% off! Perfect time to make some holiday gifts. Friday, December 1, 2017 10:00 AM – until completed Help with last minute decorations and balloons. If you can help please meet at the Taos Plaza Gazebo on December 1st at 10:00 AM. If you are able to volunteer or for more information please contact me at 751-2037 or via e-mail jesquibel@taosgov.com. THANK YOU IN ADVANCE FOR YOUR HELP!!!! DECRIPTION: Taos Youth Hockey is a non-profit, volunteer organization in Taos, New Mexico - built around the primary principle of hockey being fun. Our organization was established 1990 and has only gotten better with age, and our youth players have earned over 15 State Championships during that time. We offer winter ice hockey and summer roller hockey to children in the Taos area ages 3-18 and want the entire community to know and understand that every kid is more than welcome to come play the coolest game in Taos. Because our program has grown from such grass roots as the pond in Kit Carson Park, we have been featured in the national magazine “USA Hockey Magazine”. It is our extremely high quality youth program that also attracts 75-100 out of town teams to Taos each season and allows us to host 4-5 tournaments per season. During one of our tournaments in 2013 we even attracted a team from St. Thomas Aquinas, Ontario, Canada to come all the way to our lovely little town of Taos. These tournaments are a huge boost to our tourism and economic development within the town of Taos. It is our belief that our continued success is a direct influence on the sport and event related tourism model that also boosts our economic development. 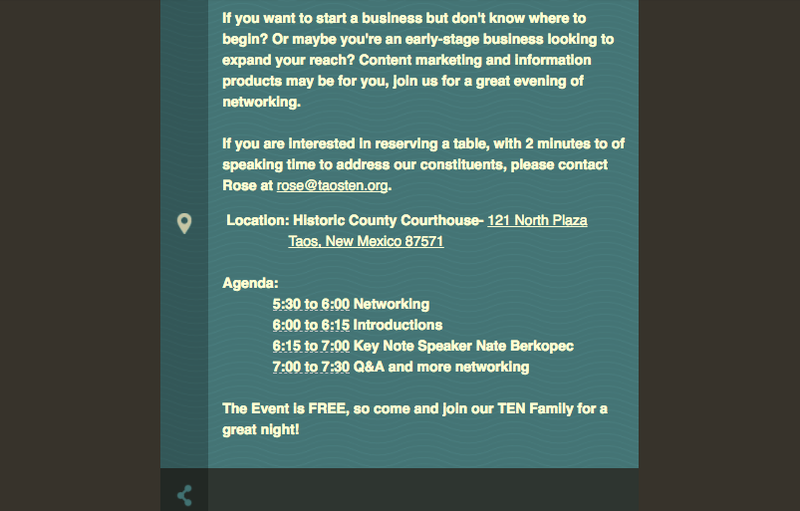 Key note speaker Karl S. Halpert is President and CEO of Private Label Select, an FDA manufacturer of Organic and Natural Cosmetics and Personal Care products, with forty employees in Taos, NM. PLS is an internationally recognized leader in bringing natural and organic goods to Mass and Drug Retailers. 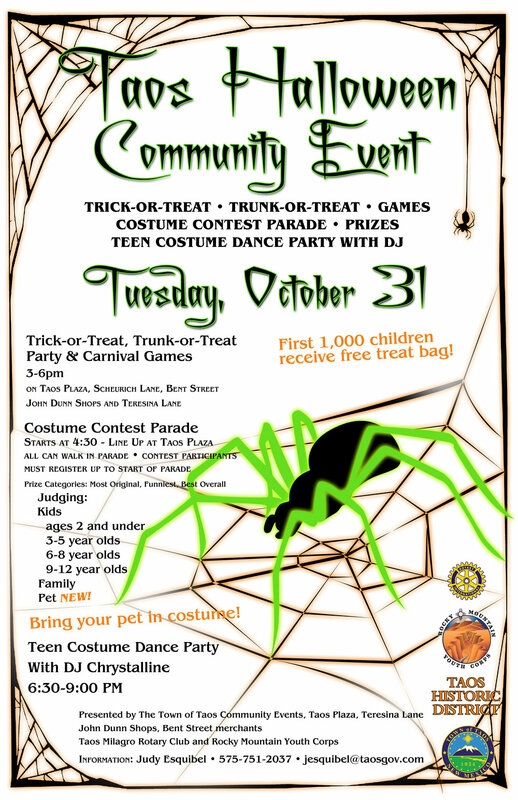 DECRIPTION: The Town of Taos Community Events, Taos Plaza Merchants, Teresina Lane Merchants, John Dunn Shops, Bent Street Merchants, Rocky Mountain Youth Corps, and Taos Milagro Rotary Club will be hosting a Children's Halloween Party on Tuesday, October 31, 2017, from 3:00 PM – 6:00 PM at the Taos Plaza, Teresina Lane, Scheurich Lane, John Dunn Shops and Bent Street. The event will provide the children of Taos with a fun, safe, supervised Halloween Event. The traditional costume contest has a little change this year to a costume contest parade staring 4:30 PM. If you would like to walk in the parade, please line-up at Taos Plaza. Everyone is welcome to walk in the parade, but, if you want to be part of the contest, participants must register. Prizes will be awarded to the child, family or pet with the Most Original Costume, Funniest Costume, and Best Costume. The judging will be for children ages 2 and under, 3-5 year olds, 6-8 year olds, 9-12 year olds, Family and Pet. We will also be giving out Halloween bags filled with treats and goodies to the first 1,000 children. Merchants from all the around the Taos Historic District (Taos Plaza, Teresina Lane, John Dunn Shops and Bent Street) will be handing out candy to trick-or-treaters. Merchants handing out candy on Bent Street are Chocolate and Cashmere, Dwellings Revisited, Emily Benoist Ruffin Goldsmiths, Ennui Gallery, FX/18, La Chiripada Tasting Room, Lambert’s of Taos, Mudd-N-Flood, Ortenstone Delattre Fine Art, Robert L. Parsons Fine Art, Sam’s Shop, Taos Blue, Taos Cookery and The Underground. On Teresina Lane merchants are Kimosabe, Taos Adobe Quilting, The Alley Cantina and Twril Courtyard giving out Halloweenie hot dogs from 4 PM to 6 PM. On John Dunn merchants are Amina’s Children’s Boutique, Ammann Gallery, Bent Street Café & Deli, Clarke & Company Menswear, Inc., Coffee Cats, Common Thread, Coyote Moon, La Tierra Mineral Gallery, Las Comadres Gallery, Letherwerks, Little Place Boutique, Mariposa Boutique, Marshall’s Great Noodles, Monet’s Kitchen, Mooncat Fiber, Op. Cit. Bookstore, Seconds Eco Store, and Stepping Out. On Taos Plaza South merchants are Atira’s Southwest, Coyote Club, Hotel La Fonda, Natural Accents Gallery, Pueblo Collection, and Rocky Mountain Chocolate Factory. On Taos Plaza East merchants are At Home In Taos, Charles Collins Gallery, I Love Taos, Martinez Art, Parcht Bottleshop (candy given away at LMNOC Broadcasting, LLC. booth, Sage Fine Art, Santa Fe Olive Oil and Balsamic Company, and The Gorge Bar and Grill (candy given away at LMNOC Broadcasting, LLC. booth). On Taos Plaza North merchants are Frank Seckler Gallery, Mesa’s Edge, Nambé, Taos Accessories, Taos Mountain Candles, Taos Mountain Outfitters, Taos Trading Company and Smoke Signals. On Taos Plaza Westmerchants are Village Shop, Made in New Mexico and Taos Mountain Candles. Local businesses and organizations will provide decorated “trunks” full of treats for trick-or-treating and various carnival games with prizes. The Trunk-or-Treat and carnival game participants on Taos Plaza are NCRTD Blue Bus, Taos Mountain Casino, Kit Carson Electric, Kit Carson Energy, Inc. Choice Wireless, Peoples Bank, Fraternal Order of Eagles 3489 Ladies Auxiliary, The Taos News, The Potter’s House Christian Church, Mariposa Realty of Taos, Carson National Forest, New Mexico Gas Company, Robert Medina & Sons Concrete, Vigil’s Towing Unlimited, Taos Pueblo Department of Public Safety, Taos Milagro Rotary, Taos High School Photography Program, LMNOC Broadcasting, LLC and Pirate Ship. On Scheurich Lane Trunk-or-Treat and carnival game participants are Taos County Crimestoppers, Big Brother Big Sister Mountain Region Taos/Colfax, LULAC and Taos Milagro Rotary. On Bent Street Trunk-or-Treat and carnival game participants are Taos Lions Club, Children, Youth and Families, Northern Regional Housing Authority, Taos Foursquare Relentless Youth Group, Taos Youth Hockey Association, Taos Swim Club Inc., Taos Ski Valley, Smith’s Food and Drug, El Monte Sagrado, Rio Grande CPA, and VFW #3259. On John Dunn Pathway Tatyana will be doing Face Painting compliments of the John Dunn Shops. Taos Plaza and Bent Street will be closed from 5:00 AM to 12:00 AM; however, the Taos Plaza Merchants and Bent Street Merchants will be open to foot traffic. FREE event parking will be available at our Lady of Guadalupe Church, Loretto Parking Lot, Town Hall, and Taos Public Library. AFTER 5:00 PM all metered parking lots will be free. For handicapped parking and for people requiring ADA access to the event, there will be extra parking at Guadalupe Parking Lot and the area next to the McCarthy Parking Lot directly behind the old County Courthouse. Every year the community event keeps growing in attendees, games and “trunks.” The Community of Taos thanks everyone participating in this wonderful Halloween event that is so successful for the children and families of our Taos Community. This event is made possible because of all the numerous volunteers, staff, judges, security, merchants, business owners, organizations and sponsors that help put it together. We are a team working together to bring the community a fun, safe, and supervised Halloween event. CONTACT: Judy Esquibel at 575-751-2037 or contact her via e-mail at jesquibel@taosgov.com. WHEN: Saturday October 21, 2017, 8am-12. DECRIPTION: Nate Berkopec is the owner of Speedshop, a web development consultancy for Ruby on Rails applications. Nate has worked for many startups and tech businesses, such as Getty Images, Intercom, and Facebook. Nate published "The Complete Guide to Rails Performance" in 2016. Nate will cover the basics of writing, email marketing, and product development, and how he combined them to make a full-time income off his particular knowledge and expertise. Ride as much or as little as your legs allow! DECRIPTION: youth ages 8-17 will have a chance to take to the skies on Saturday, September 23, 2017, as Taos Aviation Services, Taos Local Pilots, Taos Regional Airport, Town of Taos Community Events and Town of Taos Visitor Center hosts its 9th Annual Taos Youth Flight Rally at the Taos Regional Airport. The Taos Youth Flight Rally event created to interest young people in aviation. As part of the event is Free airplane rides. We hope to build one-to-one relationships between our Taos Local Pilots and young people, giving a new generation a chance to learn more about the possibilities that exist in the world of aviation. Pilots at the event will also explain more about their airplanes allowing young people to discover how airplanes work and how pilots ensure each flight is conducted in a safe manner. Each pilot volunteers their time, fuel and aircraft so the flights can be provided free of charge for interested young people. Flights will begin at approximately 8:30 a.m. through 11:30 a.m. 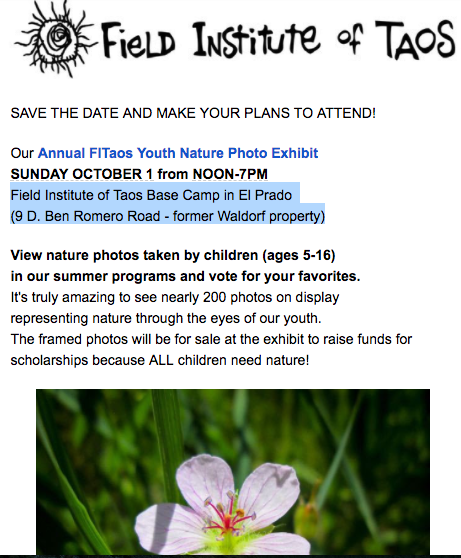 LOCATION: Registration forms will need to be picked up, completed and returned to the Town of Taos Visitor Center located at 1139 Paseo del Pueblo Sur by Tuesday, September 19, 2017. DECRIPTION: Brooks Thostenson is one of the founders of Taos Mountain Energy Bars. Join us at the KTAOS Solar Center for a talk about developing the business from a small two-man adventure, into a nationally recognized brand. DECRIPTION: We are looking for art work created by people with mental illness who live in New Mexico. Paintings, sculptures, mixed media, found objects for sculptural art. Individuals should email me a photo of the work, the medium used, and the size of each piece, and the date created. Individuals do not have to be professional artists. They can be but most of our artists have never been shown in a professional gallery. The art we are collecting is for our inside] out Art Exhibition: The heART of Mental Illness which will be showcased from September 15 to October 14, 2017 at the Santa Fe Community Gallery in the downtown area of Santa Fe. There will be a 50/50 split between the artist and Compassionate Touch Network. We will cover the cost of any framing, if needed, all publicity and advertising. I will be happy to speak with each individual about more details if they are interested in the show. The show is curated by Bruce Velick so not every piece will be accepted into the show.